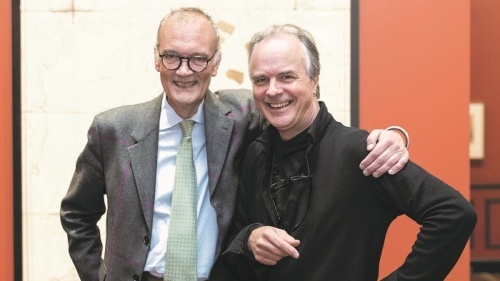 LIVE wire National Portrait Gallery director Angus Trumble ends his five-year tenure today (December 7) on a high note. Melbourne born-and-bred, Trumble, who came to the NPG in 2013, was formerly senior curator of paintings and sculpture at the Yale Center for British Art in New Haven, Connecticut, and before that the curator of European Art at the Art Gallery of South Australia. He has overseen a dynamic period at the gallery with shows of serious portraiture and fun exhibitions too such as “The Popular Pet Show” and “Starstruck: Australian Movie Portraits”. He also lead the hoofers in an NPG entry into the video competition, “Museum Dance-Off”. He ends his tenure, typically, “with a flourish”, after announcing that the NPG publication, “Dempsey’s People: A Folio of British Street Portraits 1824-1844” had been awarded the 2018 William MB Berger Prize for British Art History. The author, ANU associate professor of art history David Hansen, recently accepted the prize at a ceremony at the Society of Antiquaries in Burlington House, Piccadilly—Trumble went too. “It really is our David and Goliath moment; we were up against a large number of heavy hitters – the Getty in Los Angeles; the Frick Collection in New York; the National Galleries in London, Edinburgh and Dublin; the V&A; the BBC; the Royal Academy; Yale University Press; Cambridge University Press; and Oxford University Press (among others),” he said. While thanking the chairman and board of the NPG “for having given me the precious gift of repatriation”, Trumble cites as highlights over the past five years the visit of the Duke and Duchess of Cambridge, “The Popular Pet Show” and, of course, “Dempsey’s People”. Trumble will now work towards completing a trio of books and will travel to Malta to see two Caravaggio paintings – the “Beheading of St John the Baptist” and “St Jerome”. He is replaced as director by Karen Quinlan, who comes from the Bendigo Art Gallery.